"This recipe is from my mother-in-law and it's the only way to get my husband to eat bananas and my kids to eat zucchini. I make them into muffins because they get eaten faster than the bread. But it's great either way." Preheat oven to 350 degrees F (175 degrees C). Grease 36 muffin cups or line with paper liners. Mix bananas, white sugar, zucchini, applesauce, eggs, brown sugar, and vanilla extract together in a bowl. Combine all-purpose flour, whole wheat flour, cinnamon, salt, baking soda, and baking powder in a sifter and sift into the banana mixture; add oats and mix until batter is just combined. 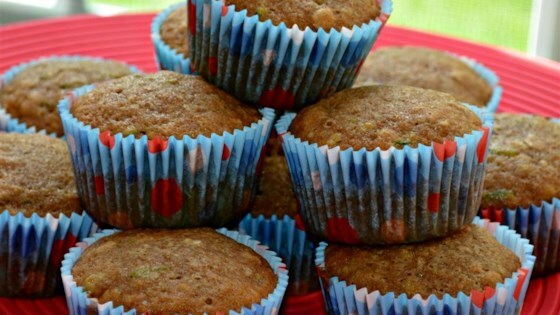 Fill muffin cups with batter. Bake in the preheated oven until a toothpick inserted in the center of a muffin comes out clean, about 20 minutes. Cool muffins completely in the tin before removing. This recipe can also be made into 2 loaves. Bake for 40 minutes, turn off oven, and let bread sit in the oven for 15 minutes more. These turned out really good. My daughter who is a picky eater loves them. I cut the white sugar by 3/4 cup and it was still sweet enough for us. I live in high altitude. I should have added more flour and cooked longer. I will give them another try. Delicious. I made mini muffins and baked for 15 minutes. Correction to my previous review, I actually cut all the sugar and used only whole wheat flour. Still a hit!